Successfully Added FLSUN-S 3D Printer - DLP Printing Technology, 4.3-Inch touchscreen, Wi-Fi, USB Port, UV Resin to your Shopping Cart. FLSUN S 3D Printer uses DLP curing technology for efficient printing speeds. A 4.3-inch screen displays the real-time printing status. The compact sleek design makes it easy to transport and store. Has USB support for offline printing and Wi-Fi for online printing. DPL printers use a UV projector to curate your picture layer by layer. As the printer exposes a whole layer at a time it can print faster than many FDM types of 3D printer. It has a maximum print volume of 108x68x200mm and can print to a 1080P resolution so you will enjoy finely details results when printing small-scale products. With the USB support the FLSUN-S can work independently and thanks to Wi-fi when you want to print online you don't need to worry about cables. This printer is a sensational option for beginners and experienced 3D modelers who want to play with the medium of resin. 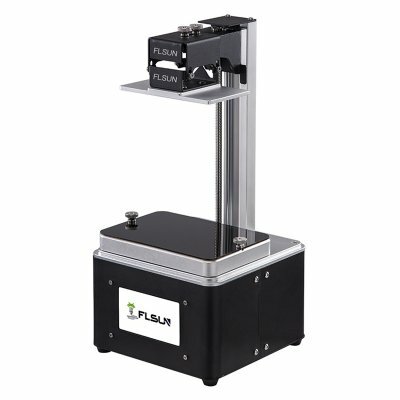 The FLSUN S 3D printer comes with 12 months warranty, brought to you by the leader in electronic devices as well as wholesale 3D printers and cool gadgets.